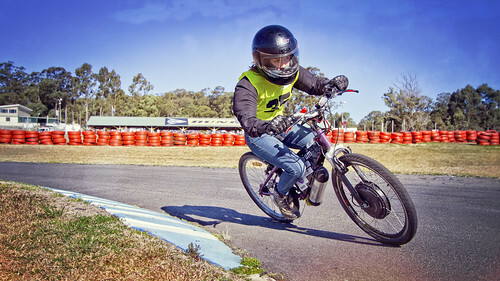 The ebike entry of Maitland Grossman High School all girls team (Team Titanium) found themselves worthy winners of the inaugural Quiet Rush "EcoGeek Factor X incentive award" on Sunday at the 2013 HunterEVPrize race held at Cameron Park Raceway. With over 20 schools participating as part of National Science Week, including a team from Perth, the girls entry caught the eye of Brian Hill, founder of Maitland based online eBike business QuietRush. Their team effort in resource recovery (breathing new life into old objects), demonstration of their commitment to crossing the gender gap in popularising practical science and demonstration of excellence in the Maitland region were the winning criteria to help them cross the line in taking home the award. "As a born and bred Novocastrian and entrepreneur, I'm intimately aware of the breadth and depth of skills and capacity for Innovation and Manufacturing in the Hunter region. It was this capacity that saw me relocate back to the Hunter after more than a decade away, working on large scale technology and systems integration challenges in national scale projects. I was keen to recognise the hard work and efforts of up and coming stars of tomorrow that will be the next generation of problems solvers, scientists and entrepreneurs. I'm aware of the scale of economic transformation and population health challenges here in the Hunter region and wanted to come up with an Award category that rewarded focus on solutions that showed an integrated design approach, with a green business and population health twist. Our offroad eBikes, designed and made here in Australia, are a viable commercial example of that focus. Our Stealth eBikes are renowned as versatile, rugged and well designed across our international customers. We think events like this, run with such professionalism by the Tom Farrell Institute and supported by local industries, will help reposition the Hunter as a centre of excellence for the next generation of high value manufacture and showcase transport solutions that tackle climate change and population health challenges. By participating as race entrants and taking out 2nd place in the 1500 class, with our standard specification Stealth Fighter eBike, we wanted to help demonstrate the potential in tackling tomorrows transport challenges with solutions that are available today, within Australia, delivering swift, silent riding options that can still keep riders active and provide vehicles flexible enough for a variety of end-uses. As the only all-girls team in the event, the girls from Grossman High School might not have had the fastest bike on the day, but they demonstrated the right focus in working well as a team, tackling diverse learning challenges and bringing credit to their school and the Maitland region." Quiet Rush are a trusted supplier of tough+powerful hybrid electric bikes for demanding applications, and clean transport solutions that assist rider effort. We are a Hunter region business, servicing Eastern Australian customers.